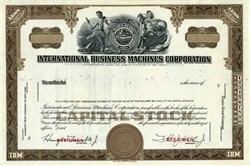 Beautiful specimen certificate from the International Business Machines Corporation. This historic document was printed by the American Banknote Company and has an ornate border around it with a vignette of two women with the business logo. This item has the signatures of the Company’s President, Thomas J. Watson, Jr. and Secretary. The older style IBM certificate are scarce and very desirable. Thomas John Watson, Jr. (January 14, 1914 – December 31, 1993) was an American businessman, political figure, and philanthropist. He was the 2nd president of IBM (1952–1971), the 11th national president of the Boy Scouts of America (1964–1968), and the 16th United States Ambassador to the Soviet Union (1979–1981). He received many honors during his lifetime, including being awarded the Presidential Medal of Freedom by Lyndon B. Johnson in 1964. Watson was called "the greatest capitalist in history" and one of "100 most influential people of the 20th century". The company which became IBM was founded in 1896 as the Tabulating Machine Company by Herman Hollerith, in Broome County, New York (Endicott, New York or Binghamton, New York), where it still maintains very limited operations. It was incorporated as Computing Tabulating Recording Corporation on June 16, 1911, and was listed on the New York Stock Exchange in 1916 by George Winthrop Fairchild. CTR's Canadian and later South American subsidiary was named International Business Machines in 1917, and the whole company took this name in 1924 when Thomas J. Watson took control of it. IBM's first U.S. trademark was for the name "THINK" filed as a U.S. trademark on June 6, 1935. "THINK" was the IBM philosophy Watson summarized with a motto consisting of one word. The name was attributed to a monthly magazine called 'Think', that was distributed to the employees of IBM in the 1930s. A U.S. trademark for "IBM" was not filed until approximately 14 years later, on May 24, 1949.